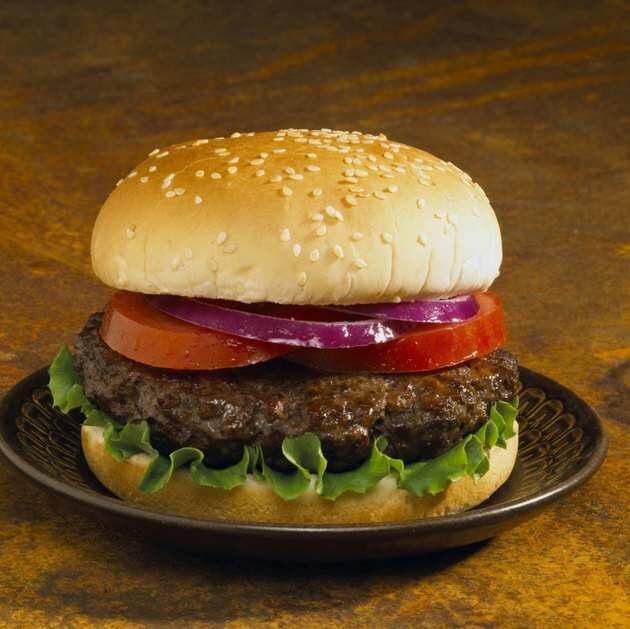 Ground beef must be cooked carefully to avoid food-borne illnesses. Ground beef can turn brown before it reaches a safe temperature, and it can also stay pink until it is not only safe to eat, but starting to dry out. It’s best to avoid rare or medium-rare hamburgers unless you grind the meat yourself, and, unless you’re a fan of dry burgers, well-done is too done. Medium-cooked burgers retain flavor and juiciness without sacrificing safety. To ensure optimal safety, medium burgers should be cooked to a specific internal temperature, not simply until the meat looks done. Spray your grill, frying pan or broiler pan with a generous amount of nonstick cooking spray. This is especially important when you are cooking the meat on a grill to keep the burger from sticking or breaking apart and falling through the grill's rack. Heat the grill or frying pan to medium, or turn the broiler on. Place the burger onto the cooking surface. Cook the burger for about six minutes per half-inch of thickness. Do not press down on the burger with your spatula while it’s cooking as this causes the juices to run out. Flip the burger carefully and cook it for another six minutes for every half-inch of thickness or until your instant-read thermometer reads 160 degrees Fahrenheit when inserted into the meat. Stack very thin burgers and insert the instant-read thermometer through the top of the stack to receive an internal temperature reading. Never judge doneness by the color of the hamburger meat.